NextEvents: We Love You. You’re Perfect. Now Change! How to best market your organization may seem like a mystery. Maybe you’re in charge of a large marketing team. Or maybe you’re the wizard behind the curtain doing it all: making trash disappear, conjuring leads, and casting spells on customers (tasks we non-wizards like to call marketing). Let’s face it, the Wizard of Oz® was just a normal, enterprising guy with access to cool technology. But he knew how to market himself, and knowing those skills is how you make magic. If the marketing magic depends on you, it’s time to study the book of tricks. In this day and age, not marketing is simply not an option. Without a rabbit or two to pull out of your hat, your organization is likely to vanish into the thin air. If you’re thinking, “Advertising, social media and personalized promotional products, oh my!” it’s time to find the wizard within. Put on your ruby slippers, Dorothy, this is your chance to feel at home with marketing. In this Blue Paper, we offer four fundamental ideas—and some promotional products—that will help you unlock your marketing potential. So, let’s start at the beginning! No, not in Kansas. Let’s start wherever your business is right now. We promise, this Blue Paper will have you easing on down the road to marketing success. Remind customers you’re different from the competition. Imprint what sets you apart on the Soft Touch Pique Sport Shirt and gift to your best customers. All marketing wizards in training must first understand the importance of branding. You want your organization to stand out in the crowd and be immediately identifiable. Think of the Wizard of Oz witches. One glance at the green face, black outfit and gravely, nasal voice told you a lot about the character. The same goes for the sparkly, elegant Glinda. The point is, you don’t have to peek behind the curtain to understand them. Their names, actions and color palettes give you a good feel for who they are and what they stand for. Mike McCracken, President of Hawkeye Aircraft Acquisitions, LLC, is like many entrepreneurs: he says he is President, CTO and COO of his aircraft acquisition company and his wife is CFO and janitor. With all the hats he’s wearing, he is also managing the company’s marketing, and he’s doing it well. Like Hawkeye Aircraft, your organization already has a heart. 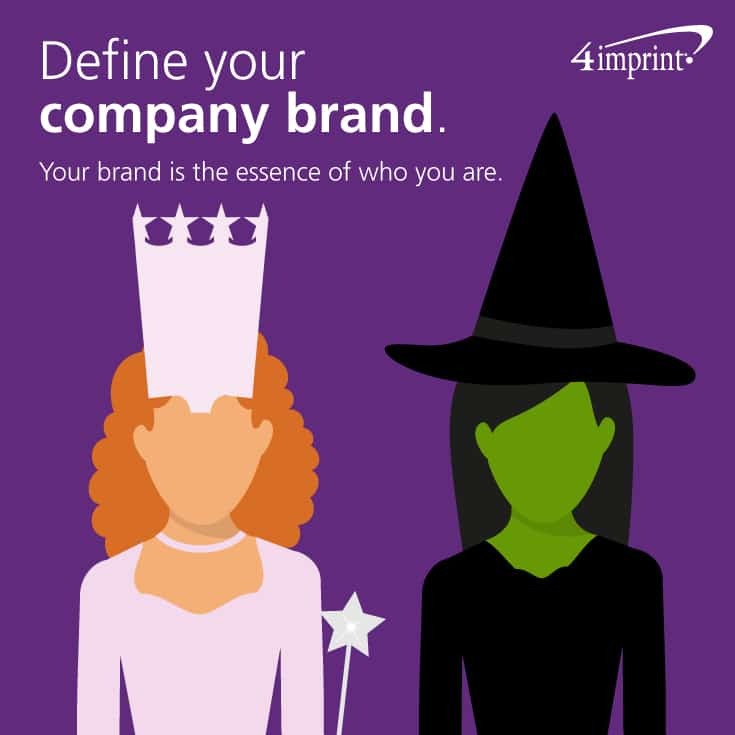 Your company brand is essentially the heart of who you are as an organization. Most importantly, it’s how you want your customers, clients and key stakeholders to perceive you. Many companies rely on experts to help cultivate their brand. But if you are on a limited budget and need to do it in-house, don’t worry: you’ve had the power all along! Head to the brainstorming table and bring along your employees. No one knows your company better than the people who work there! Tip 2: From munchkins to millionaires: Define your target market. Defining your target market goes hand-in-hand with building your brand identity, because you want to make sure the brand speaks to your target market. Who do I want my future clients to be? Then, really drill down to get a clear picture of whom you are trying to reach with your company’s offerings. Where and how do they prefer to receive communications? What are their problems and how can our company address those? McCracken knows his target market well. They’re high-income business leaders, often company CEOs, who are interested in buying a jet. They are the kind of people who are tough to shop for, because they seem to have everything. That poses a challenge when you want to buy meaningful, useful personalized promotional items for giveaways, but McCracken had an idea. He searched for giveaways that reflect his brand and tagline. “Everything we’re doing is trying to focus on how we are doing things differently. We view the world differently,” he says. To help his customers and leads “See The Difference,” he gives them cleaning cloths that can be used on eyeglasses. The Full Color Cleaning Cloth – 5” x 5” hit the right note. McCracken says he was at an event recently where a business associate pulled out the custom cloth and confessed she carries it everywhere. Choosing the right giveaways is important. To get there, you need to know your audience. 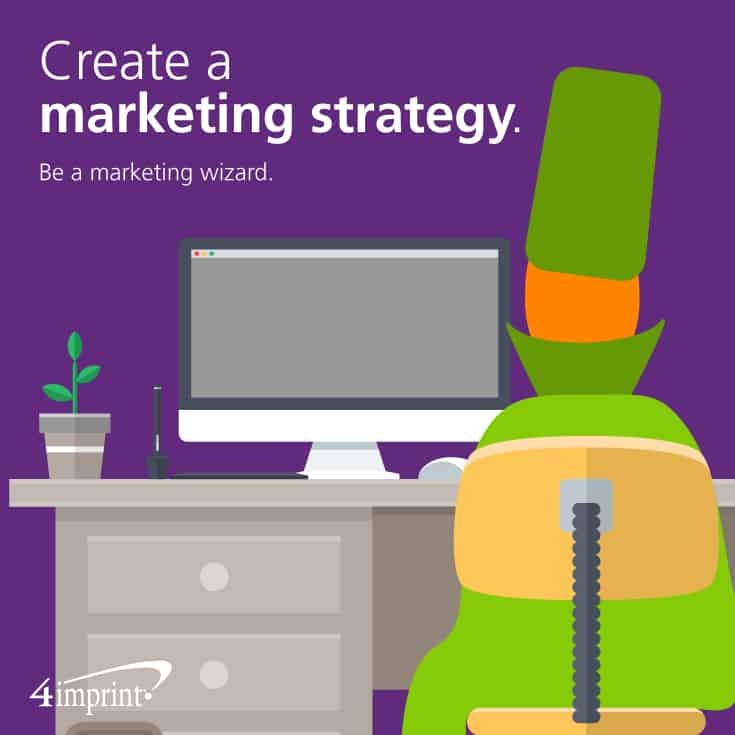 Tip 3: Take it from the wizard: Create a marketing strategy. You know your target audience, and you have an understanding of what your business is at heart. Now it’s time to plan how you will reach your key stakeholders with your message. Obviously, you can’t do it all, so choose carefully based on where your audiences are and how they like to get their news and information. You may want to develop a marketing strategy for the full calendar year or the fiscal year. Either way, revisit it at least quarterly, to make sure you’re on track and your organization’s goals have not changed. Remember marketing is an investment. You’ll want to determine how you will measure success with each strategy to get a clear picture of your ROI. Decide how to best reach your target audiences. For Mike Nitroy, assistant manager of the Millersville University store, the decision was obvious. College students always have their phones with them. So, he did some research and found an app that could be used to launch promotions, answer questions, reward customers and engage students online. “It gets people thinking about shopping here and gets them in here,” he said. The app also allows the store to offer incentives to repeat customers. Every time someone with the app shops at the store, they get a virtual punch. Those with 10 punches get a free prize during finals week, or they get to choose a grab bag. In the wake of their marketing success, Nitroy offers this advice for those looking to up their marketing game. In the industry, we call that wizardry ROI. Listen to your customers and prospects. Join the online conversation. Social media is where it’s at, and most audiences want to connect with you online. Do some research on which social networks your target audiences tend to use, and then stake your claim. But remember, social media isn’t a one-time project; it’s an ongoing conversation. Be responsive and helpful, engaging and, when appropriate, fun! Just make sure to stay true to your brand. Crossing over into non-brand related topics could alienate the audience you’re hoping to reach. Say something new and share it widely. Make wow-worthy content. If you’re in the industry, you’ve no doubt heard the marketing adage, “Content is king.” But if you’re new to marketing, the concept might be a bit of a mystery. Content marketing using blogs, e-newsletters and web articles is a powerful way to leverage SEO purposes or to improve online engagement. 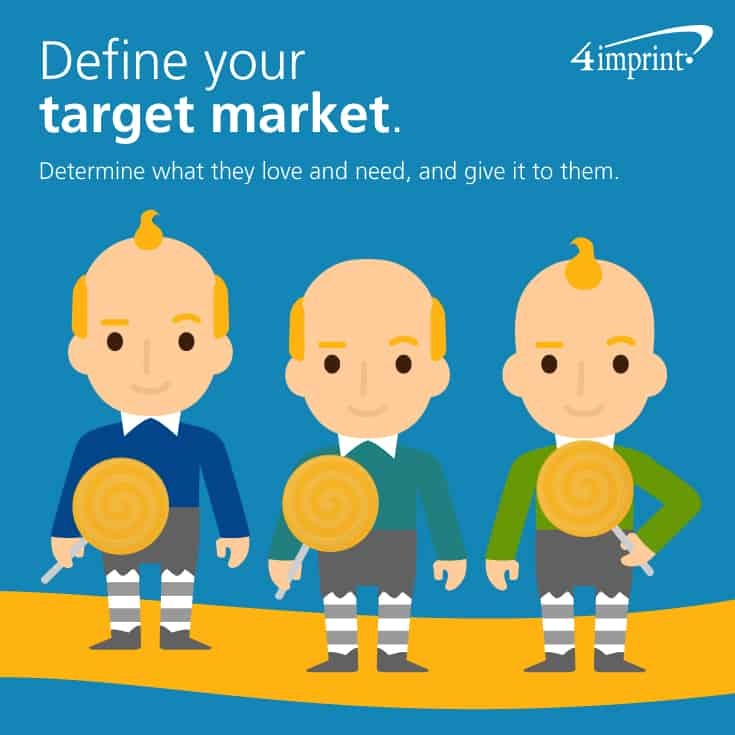 Keep your target market personas in mind as you develop content and give them stuff they crave. That’s a winning strategy. Will you host events? Attend trade shows? Have a booth at the local festival? Speak to local groups? Figure out where your target market will be throughout the year and where the best places will be for you to set up shop. Then determine what marketing materials you will need at those events. Give your brand a professional look with imprinted event banners, tablecloths and embroidered polo shirts for your staff. Remember to order creative marketing promotional items and custom giveaways. Giveaways for companies are appreciated and sought after at any event or meeting. Creative and engaging promotional products keep your customers thinking about you long after the event ends. Guerilla marketing could be your ticket to marketing wizardry, particularly if you’re on a tight budget and are open to being creative. 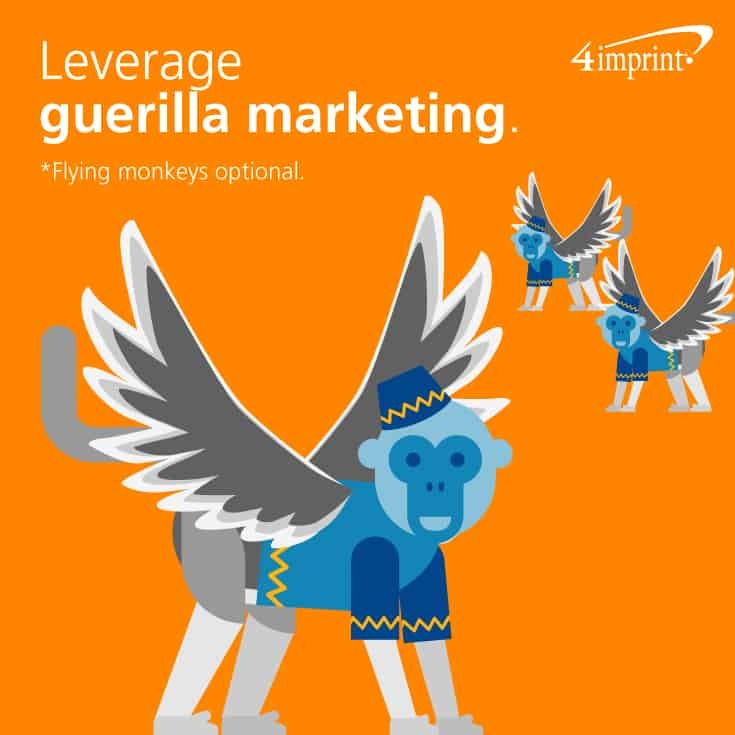 What’s guerilla marketing? Simply put, it’s a marketing strategy using unconventional, memorable and low-cost tactics. Creativity can help you rise above your competitors because it makes you memorable. Think about it. Most people vividly recall the movie scene with the flying monkeys because it was so unique and well-presented. Brands can do the same thing, no monkeys required. Chelsea Baratto, founder, writer, and self-proclaimed “one woman show” for 700smiles, launched a hashtag promotion recently in tandem with her blog, which takes an unflinching look at motherhood. After struggling with infertility, getting pregnant, learning her baby had a cleft lip, and overcoming all of the hurdles of being a new mom, she realized how much moms could use some encouragement. Inspired by the movie Bad Moms, she decided to start a #goodmom movement. She sought out an affordable way to pay it forward. Her guerilla marketing tactic was born. The idea quickly became popular and Baratto got the chance to see its impact first-hand with the help of two personalized promotional items. She brought custom Post-it Notes – 3″ x 4″ and logo’d Massager Pens to a recent new mom expo. Mothers clamored for the 500 massage pens, which were gone within the first hour. But the Post-it Notes gave Baratto the chance to talk about the #goodmom movement. Bottom line: Deploy your target audiences to join you in your guerilla marketing efforts. Being tasked with managing the marketing for an organization is no small endeavor. It’s like magic: Those who do it well make it look so easy. But for those who struggle, it can seem like a trick gone wrong. With the right tools in your marketing toolbox, and the helpful tips in this Blue Paper, you can be a wizard in your own right. With the power of personalized promotional items, you can make them feel right at home with your brand. And there’s no place like home. Events: We Love You. You’re Perfect. Now Change!